Location St. Joseph's Rd, Kilkenny. 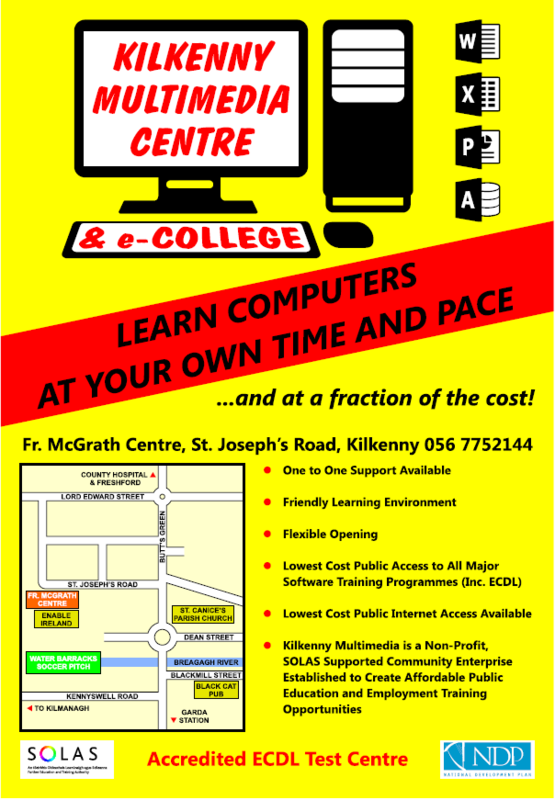 Welcome to Kilkenny Multimedia Centre located in the Fr. McGrath Family Resource Centre, St. Joseph’s Road, Kilkenny. We offer training in the European Computer Driving Licence (ECDL) at a one to one support in a friendly learning environment. Computer training is provided weekly, Mon-Thurs between 9:30 am and 1:00pm. Learn to use Microsoft Office programs such as Word, PowerPoint, Excel, Access while also learning the basic essentials of computer and internet usage. Free ECDL training provided for people on Jobseeker’s benefit/allowance, contact us, using the details below, for further information.